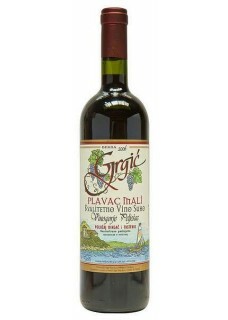 Plavac Mali (“little blue" in Croatian, referring to its small, bluish grapes) grew in the prestigious Dingač appellation, a small, steep area of vineyards perched above the Adriatic Sea on the south-facing slopes of the mountainous Pelješac Peninsula. The winery is just north of the historic walled city, Dubrovnik, in the southern Dalmatian wine region. Deep ruby color tinged with garnet. Distinctive aromas of muddled plum skins, mission fig, black cherry, and dried cranberries, with hints of Mediterranean herbs, sea salt and powdered limestone, and infused with sweet oak notes of chocolate. On the palate, the wine is a contradiction of rusticity and elegance: bold, somewhat course tannins give a rugged frame to a mouth feel that seems smooth, rich and lush all at once. Super ripe black fruits, dried fig, spice, anise and mocha notes coat the palate and linger on the finish. Bright acidity provides the vibrancy to give it lift and freshness, and the warm alcohol glow yields to the sun-baked flavors. Still young, the wine would benefit from a few years’ cellar time – or 1-2 hours in the decanter prior to serving. Food pairing: Grilled and cured meats, hard cheeses, and pizza.